Properties in Portugal are more popular than ever before, with an ever increasing number of expats following their dream to find that ideal holiday home in the sun. Boasting many of Europe’s best beaches, and a wonderful year-round climate, it is not surprising that Algarve properties are the most popular in Portugal amongst international house hunters. Throughout Algarve, old traditions come together with more cosmopolitan ways of life in a land-scape of immense natural beauty. Gorgeous beaches line the coast, from secluded coves with spectacular cliffs, to vast stretches of golden sand and extensive dunes. Away from the sea-side are the rolling hills where it is a delight to discover quaint medieval villages, pine forests and vineyards. With golf in abundance, chic marinas and very beneficial Portuguese tax programmes, Algarve has developed into the region of choice for the more discerning and selective type of second home and holiday homebuyer. Algarve’s first-class golf courses, grand scenery and year-round warm and sunny climate have made the region the top golfing holiday destination in Europe, attracting players from around the world. An incredible total of 42 9-hole and 18-hole layouts may be played year round at 35 clubs within the Algarve zone of the Federação Portuguesa de Golfe. The region chalked up almost 1.2 million rounds in 2015 – a significant rise of 7% from the previous best year (2007) and almost 8% higher than 2014. The golf courses are internationally recognised for their exceptional quality and beauty, many having been designed by prestigious players and legendary champions such as Sir Henry Cotton, Rocky Roquemore, Arnold Palmer, Jack Nicklaus and William Mitchell. Leading golf courses include Monte Rei Golf Club; Quinta do Lago’s three championship courses including the iconic South Course; Vale do Lobo, Royal & Ocean Courses; San Lorenzo Golf Club and Oceanico Golf with seven championship courses including Vilamoura’s famous five. Apart from an enjoyable and high quality lifestyle, Portugal offers new residents a special and very attractive tax regime that is applicable for a period of ten consecutive years. Is retirement on the horizon? If you have not lived in Portugal any of the last five years and are benefiting from interests or dividends or if you are planning to retire, you may be able to take advantage of the special tax regime. Under the rules of the Non-Habitual Residents scheme, employment and self-employment income from high value-added activities of a scientific, artistic or technical nature (a full list of activities is published by the government) earned by non-habitual residents in Portugal will be taxed at a flat rate of 20%. In addition, foreign-sourced income, such as employment or self-employment income, rental income, interest, dividends and other investment income, are exempt from tax under certain specific conditions. The Non-Habitual Residency regime has attracted not just the wealthy such as bankers and CEOs, but also qualified workers, such as professors, consultants, engineers and middle-tier managers are buying properties in Algarve. Many come from France, Sweden, Finland, the Netherlands, the UK and Ireland. In addition to the climate, beautiful landscape, abundance of golf courses, Blue Flag beaches and favourable taxation regimes, Algarve is less than three hours’ flight from most major European cities. It is no surprise that luxury homes in the Algarve region are in such high demand, considering that buying a property here is not only desirable, but potentially very rewarding as well. 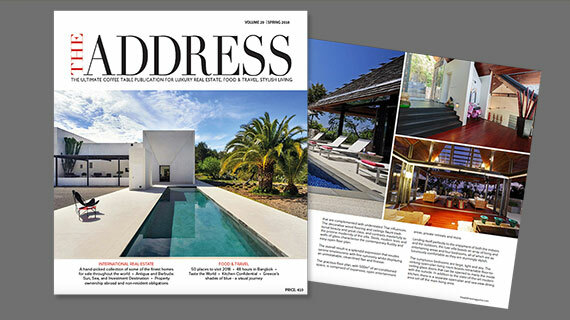 Read more about properties for sale in Algarve in THE ADDRESS Magazine.